A million of you folks out there have bought an iPhone. (We’ve got a half-dozen of them in use around the Macworld offices, too.) And judging by Apple’s fresh new $399 price tag for the 8GB iPhone, a whole lot of people will be buying them in the coming months, too. Here’s some good news for both groups: Macworld’s team of experts has used its knowledge to create a straightforward guide to the iPhone. It’s the Macworld iPhone Superguide , the latest in our series of Superguide books available as a downloadable unencrypted PDF, on CD-ROM, or as a full-color printed book. Our 92-page guide to the iPhone will bring you detailed instructions for mastering your iPhone’s most important features, as well as a few hidden ones. You’ll learn how to customize the iPhone’s settings, how to squeeze the most juice out of a battery charge, and how to connect to nearby wireless networks while keeping your data protected. It’s also got tips for using all of the iPhone’s features, a guide to converting your DVDs for iPhone use and using Smart Playlists in iTunes to fill your iPhone’s capacity the right way. And of course, the book also has a primer on the most important iPhone accessories, as well as some great iPhone troubleshooting advice for when things get a little hairy. To put together this book, Macworld Senior Editor Kelly Turner rounded up an all-star cast of iPhone experts, many of whom also write for our iPhone Central site: Christopher Breen, Jim Dalrymple, Glenn Fleishman, Dan Frakes, Rob Griffiths, Ted Landau, Dan Moren, and Jonathan Seff. 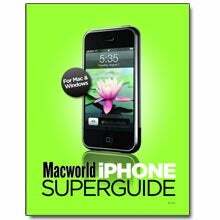 The Macworld iPhone Superguide is available in three formats: PDF for $12.95, printed book for $24.99, and as a PDF on CD-ROM for $15. If you’d like to see more before deciding to buy, we’ve created a 16-page sample PDF (920K) for you to look at. And when you decide to take the plunge, you can see all the purchasing options via the book’s main page.